Hello Folks. Jigsaword is a new game developed by KKZAP. We are sharing the solutions of Jigsaword Primates Answers. 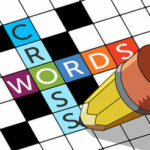 As you put together the pieces one by one you will be able to clear the view and create a crossword with all the correct words. Each puzzle in each level has a clue at the top of the screen and the hidden words are definitely related to the given clue. It is quite interesting and fun but as you advance the game becomes more challenging. If you find yourself in difficulty you can use “hints” to light up the words and help you get through.